Different couples have different ideas about what makes the perfect wedding day. Some couples look for a formal wedding packed with tradition and which focuses on the solemn bond that is created. On the other hand, there are couples who are determined to have a great deal of fun with the people that they love and care about. There is no right or wrong way to arrange a wedding. And it is important that the bride and groom can plan the wedding that is best for them. The You & Me wedding invitation from Paper Themes is not going to be suitable to many couples, but for other couples, it will be the perfect encapsulation of their relationship and the big day that they are looking forward to. 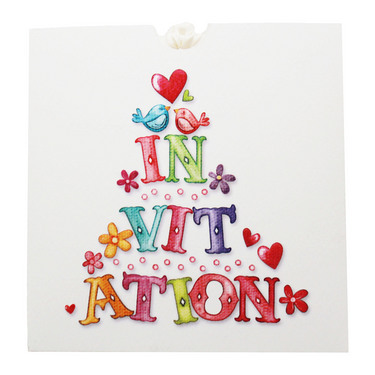 This is a colourful, cute and humorous invitation, which spells out invitation across three tiers. If you are looking to keep things simple and get the message across in the most effective manner, this is exactly the sort of card that you need. The word invitation is shaped like a wedding cake and the presence of two bright lovebirds at the top of the cake represent the happy couple. The card has a 3D effect with a raised motif produced by debossing the printed elements, helping it to stand out and grab attention. If you are looking for a wedding invitation that people will not forget, this is exactly the sort of invitation that you should buy. 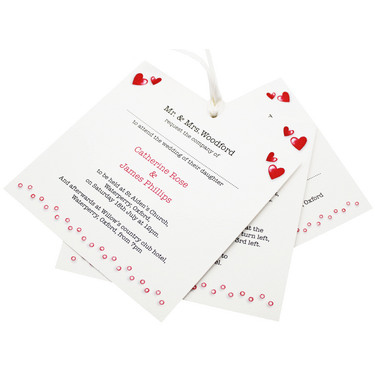 The invitation comes with three separate inserts, which allows you to send a personalised invitation, general guest information and a card for the RSVP. The package is perfectly topped off with a cream satin ribbon, adding the perfect finishing touch to an invitation which has fun and happiness written all over it. Tags: Cute, Embossed, Love Birds, Typography.